Setting goals is important for achieving outcomes, providing focus and giving the impetus to ‘get on with it and do it’. Saw ‘just do it’ on a t shirt in front of me. Well, I thought, I’m doing it; my goal of running in a 14km run with thousands of other participants. To keep ‘doing it’ for 14km without walking was my psychological challenge and to finish, feeling good, not buggered! To help motivate myself I exaggerated the number of kilometres still to compete; for some reason, this took the heaviness out of my step as if preparing my body for the distance ahead, and I used visualisation. 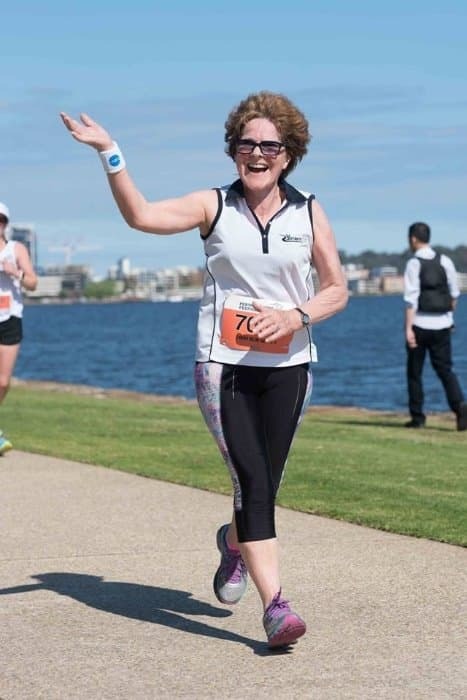 I visualised running over the fabulous new Matagarup Bridge, the ‘M’ bridge at Elizabeth Quay, saw myself the other side of the Narrows Bridge, running under the Causeway Bridge and I could hear the theme song for ‘Chariots of Fire’ while running into the equally fabulous new Perth Optus Stadium. Seems to be a theme here! Bridges and plenty of them. To help bridge the success of the goal of just ‘getting out and doing it’, required help and training and that’s where Y Striders came in! The regular training sessions and the motivation of other Y Striders who had also set the goal of running/walking into the new stadium. John W is always motivational as is Kerrie T who motivates us all with her encouragement and love of Y Striders. So did running companions Eva, Rosie and pocket rocket Pam who with little training, as she had just come back from extended holidays, ran the 14km and still beat me! 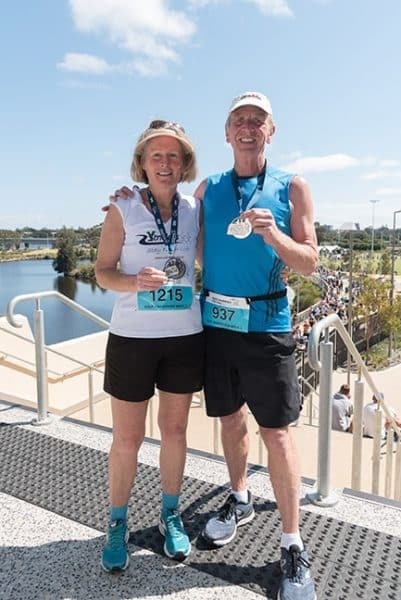 The 14km route was a beautiful circular route starting outside the stadium, across the Matagarup Bridge, around the Swan River, past Elizabeth Quay, over the Narrows along the South Perth Foreshore and into the stadium on a sunny, gorgeous, albeit warm morning. Apparently there were over 10,000 participants in the three distances of 21km, 14km and 4km. Well, I’m stoked! 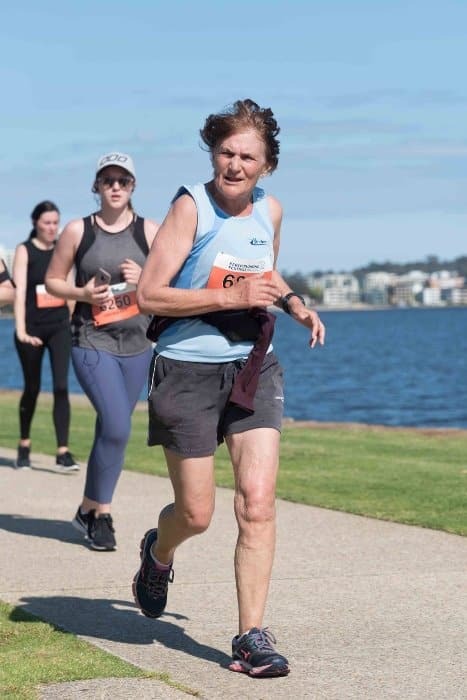 To take part in the inaugural Perth Running festival along with my John, who ran the half marathon and Sunni, my eldest granddaughter running with me in the 14km event. Stoked to be running with Sunni. Stoked because I hadn’t run a 14 km before. Stoked because the run finished inside the new Perth Stadium. It felt really good finishing there. Stoked because I kept to my steady pace and I still felt good crossing the finish line. In fact, I was emotional. 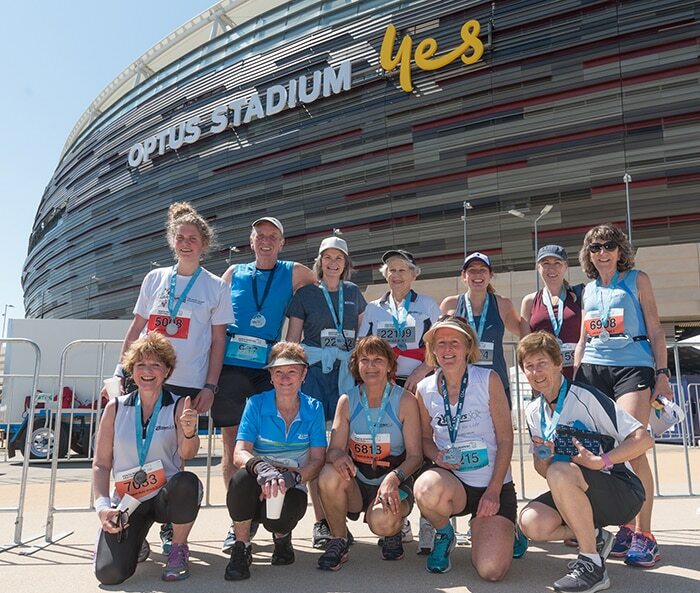 How wonderful to have Karen and Faye cheering us along the route and at the stadium, along with Jatinda, to support us along with John T and Kerrie having already completed their 21km run, at the finish line excitedly calling out our names as we ran in. Along with the Chariots of Fire’ theme in my head and the Y Strider support, no wonder I was emotional! Congratulations to Leonie, Nola, Christine, Y Strider trainer Tash and her mother, Merryl who walked or ran the 4km distance. Most of the Y Striders competing succeeded with PB’s. Congratulations to you all. A big thank you to Karen for photographing our Y Strider success. 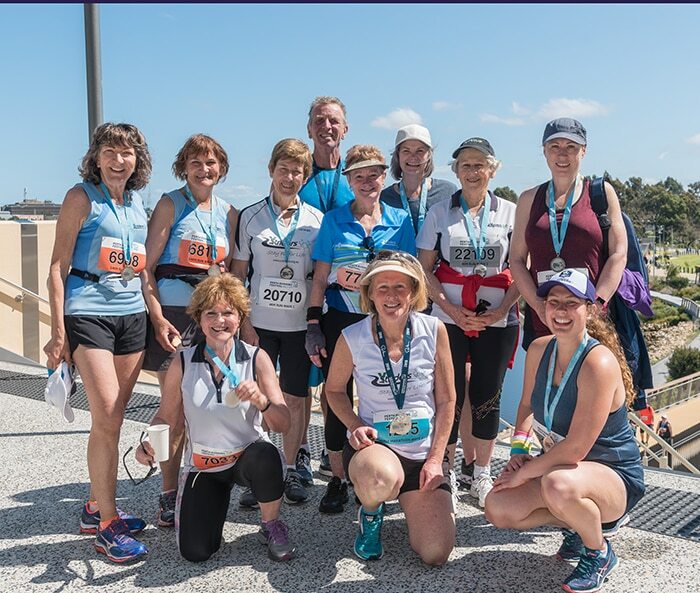 A big thank you also to Y Striders for providing and facilitating the means to achieve outcomes, for providing focus and giving the impetus to ‘get on with it and do it’.